A loud mob of pro-Arab demonstrators in Los Angeles was enraged when a lone Jewish high school Israel supporter marched fearlessly alongside them. 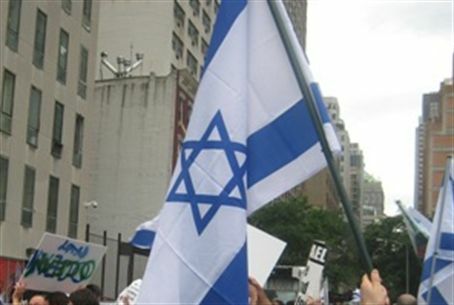 A loud and angry mob of pro-Arab demonstrators outside the Israeli consulate in Los Angeles on Tuesday became even more enraged when one, lone Jewish high school student with a yarmulke and a large Israeli flag marched fearlessly alongside them. The young man, whose name was later learned to be Daniel Pereg, seemed to be unmoved by the angry curses hurled at him by the American-Arab crowd. Though protected by a line of policemen, it appeared he could be attacked at any moment.